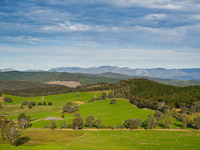 Alpine Dorpers is situated in the beautiful North East of Victoria, overlooking the Mt Buffalo range. Located 50km south east of Wangaratta, we are about 3 hours from Melbourne or an hour south of Albury Wodonga. Coming from a commercial prime lamb background, we are committed to breeding Dorpers that excel in our colder, wetter climate, but still retain their excellent performance in the dry. Working with Lincoln University in New Zealand, we identify and then specifically breed from Dorpers exhibiting footrot resistant and cold tolerant gene markers. 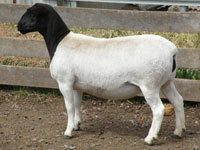 However our sheep must hold these traits alongside sound conformation and feet, and shedding ability. Our annual rainfall average is 1000mm and our paddocks regularly look onto the snow! Stud animals are measured using Lambplan to identify high fertility, larger eye muscles, lambing ease, good mothering ability and worm resistance. Originally representing bloodlines from Kaya, Winrae, Dell, Amarula, and Douwana Dorpers, our stud sheep remain some of the very best animals available in Australia today. While we support and attend our local shows, we remain committed to running all of our animals under paddock conditions, commercially. Our ewes are expected to rear their lambs on their own, testing their milking ability and mothering skills. 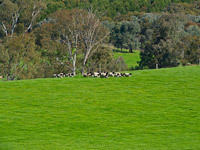 We are a fully accredited Meat Standards Australia (MSA) property which influences our animal welfare practices. 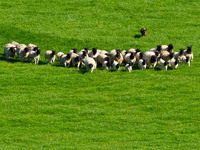 Technology and electronic eartags further enable us to track and record animals individually, as well as in groups. We are Brucellosis tested and all animals are OJD vaccinated. now turned farmer, Lambplan & genetics enthusiast! 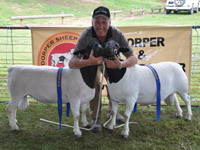 Both are passionate Dorper breeders in high rainfall, cold, non traditional Dorper terrain. Currently running over 1500 commercial ewes and stud sheep, we are committed to sharing our knowledge honestly, frankly and with integrity. As members of the Dorper Sheep Society of Australia (DSSA), Harry has also had extensive experience on the National Board, in addition to being trained in the International Classing System used by the breed. He is furthermore a nationally accredited Emergency Animal Disease officer. Inspections, all questions, and any enquiries are always welcome! Information with honesty & integrity is our aim.